You need a strong advocate who will fight for you. You also need an attorney who will give you practical advice grounded on years of litigation and trial experience, not just happy talk of an unrealistic outcome. While I have a practical eye toward conflict resolution, as a seasoned trial attorney I am not afraid to pursue your legal remedies through trial and appeal if necessary. My experience in litigating cases also enlightens my practice on negotiating and drafting documents in her other practice areas to aid clients in avoiding future pitfalls. I combine the needed aggressiveness to zealously pursue your rights in our adversarial justice system with a practical eye on what may make the best business sense to you offering you a sober analysis of your case and allowing you to weigh what steps you want to take. You ultimately make the decisions when it comes to litigation, but I am there for you to provide practical advice to aid you in making those decisions. I have represented clients in a wide variety of cases: non-compete agreements, shareholder disputes in closely held companies, boundary line disputes, disputes with home owner associations, landlord/tenant conflicts, mechanic's lien foreclosure prosecution and defense, contractor disputes, construction defects, domestic partnership dissolutions and partition actions to name just a few. I have represented both landlords who need to evict tenants violating lease terms and tenants who believe landlords are violating the terms of their leases. "Housing Court" as it is known in many Minnesota counties is an expedited process that requires your attorney to quickly grasp the issues and provide practical sound advice to avoid the pitfalls on either side of the landlord/tenant dispute which may damage you. If you are a licensed professional in Minnesota you are subject to investigation and enforcement actions by the agency that has issued the license to you. You may find yourself subject to an investigation or inquiry that could result in the loss of your license. I have represented a number of licensed professionals negotiate the administrative hearing process. Do not delay in contacting an attorney once an investigator has contacted you! Words have meaning and contracts, written, oral and implied, can all be enforceable. Through the years, my litigation practice has informed my contract drafting and review for clients. I take care to listen to what you need and then draft contracts that reflect your needs and protect you. Do not take contract drafting lightly, it can cause headaches for you in the future. Buying, selling or leasing real property can be stressful. I have experience in transactional work related to buying and selling both commercial and residential real estate, as well as both drafting and reviewing leases for commercial or residential properties. I can help you to resolve those challenging "title" issues that oftentimes arise when either buying or selling and make absolutely no sense to you. I also have helped many people selling or buying their homes in For-Sale-By-Owner ("FSBO") transactions. You may find, as a seller of residential property, that you will save significant money using an attorney to prepare documents and give guidance in a FSBO transaction versus going through a realtor. Condominiums, town homes, cooperatives and some single family home developments may all be considered common interest communities ("CIC") subject to certain restrictions set forth in the Declaration creating the legal entity and certain statutory obligations. I have advised both home owner associations and individual unit owners in navigating the rights and responsibilities of living in a common interest community. Reviewing documents and understanding what you are reviewing and how it impacts you is vitally important before you make one of the larger decisions in your life, buying a home in a CIC community. Let me help you and take the mystery out of owning a unit in a CIC community. If you want to be the one who decides what happens to your assets and valuables upon your death, then you need to create a will. In some instances, the creation of a revocable trust, sometimes called a "living trust" would also be an effective tool to protect your privacy and avoid the need for a probate proceeding upon your death. These tools, in addition to health care directives (also known as "Living Wills") and Power of Attorneys are all pieces of your Estate Plan. When you contact me, I will send you a worksheet to help you organize your personal information that aids in deciding what tools are best for you. After reviewing your completed worksheet and understanding what you want you're your death, I create draft documents for your review, comments and questions. Once your documents are in final form, we meet to have them properly executed. I want to take the surprise out of what all this work would cost you, so once I have reviewed your completed worksheet and understand your goals and the tools we can use, I will provide you a fixed price fee for the work to be completed. Loved ones die. 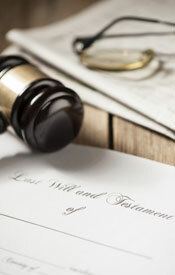 Transfering their assets after death if they had a will or if they did not occurs during a court proceeding called "probate". Oftentimes, this must occur when transferring real estate that may have been owned at the time of death. To act on behalf of the decedent, you will need the authority of the Court by being appointed a personal representative. Call for more information about the process to see if I can help.